We are your online resource for Cavitron ultrasonic rentals for your clinical board exams. Rentals can also be used for dental offices while equipment is being repaired, or even to test out new equipment before purchasing something new. 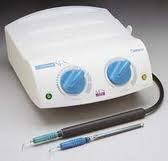 Ultrasonic tips and prophy handpieces are also available. Rent Ultrasonic Units, inserts and polishing handpieces.